Do you ever have an idea that you just cannot shake. Doing an acrylic pour on furniture has been flowing through my thoughts and whispering in my ear. 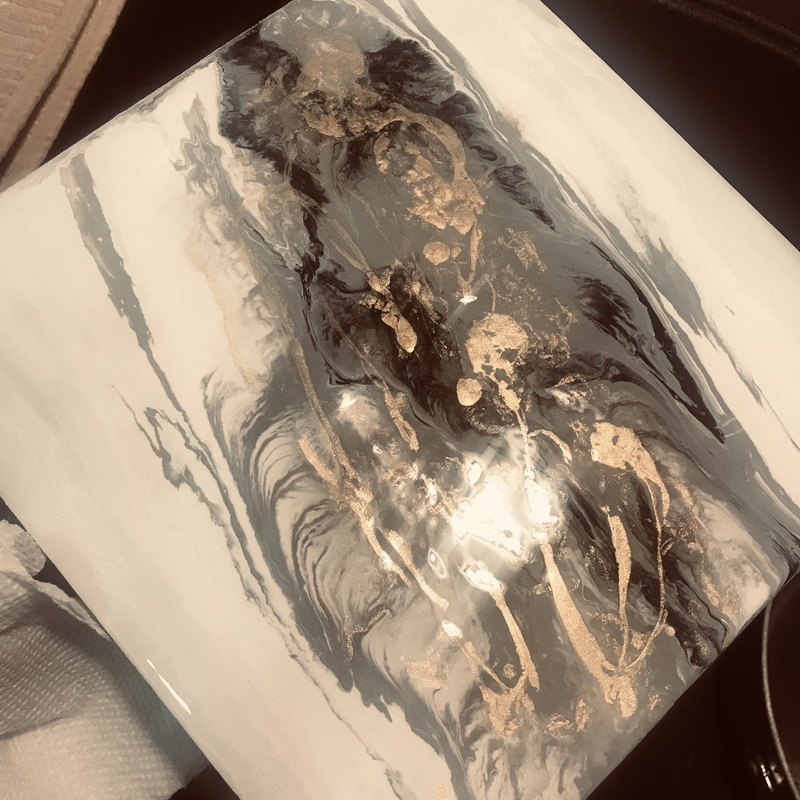 I was a little nervous about my decision to make my first pour on the piece I finally chose. 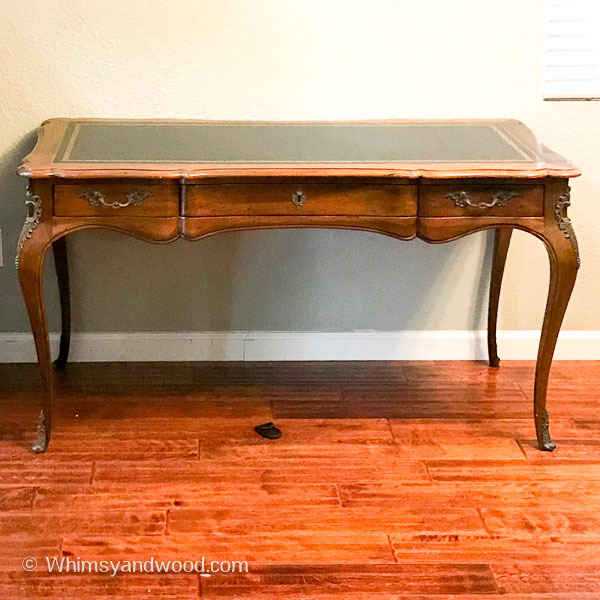 I had picked up a beautifully made, high end vintage John Widdicomb Desk from a lady who lived in the cutest little 1930's cottage. I just image it was in that house for all of it's years before we met. 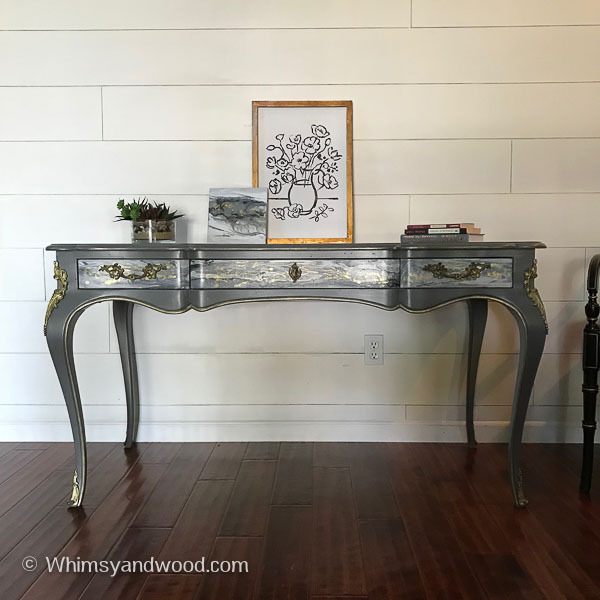 I loved the desk at first sight! Finding the Widdicomb plaque inside was the raspberry on the cheesecake for me. The desk was solid with beautiful curves. It had the original leather top with only minor wear. Are you an accessory lover? 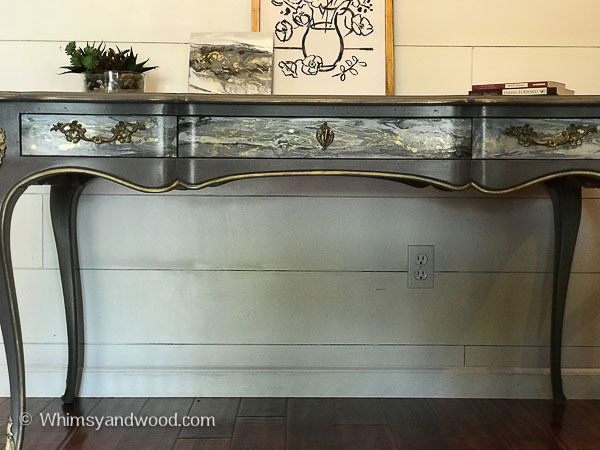 This desk had the most amazing metal accent pieces. Darling metal shoes held in place with tiny screws, and exquisite metal accent pieces that sat high on the curves of the legs & were held in place with brass nails. 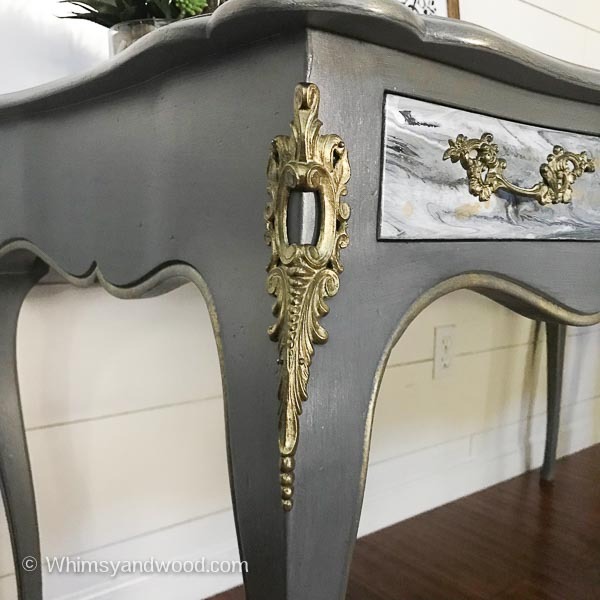 I geek out over the attention to detail found in high end furniture. Exquisite. This post may contain affiliate links. Purchases made from links support the content on this page. I use & like every product I link to. I could not wait to spend time painting! I had a traditional look in mind. Mature grays and gold highlights to play off of the gold floral boarder of the leather desk top. This combination would have been plenty, but there was that nagging whisper. The idea of a finish almost like marble. Marble with flecks of gold dancing on the surface. I just could not shake that. I felt compelled to do this acrylic pour on furniture & equally afraid that I might ruin it. After all I had never done an acrylic pour on furniture or on anything else & this desk was fetching high prices in the thousands online. 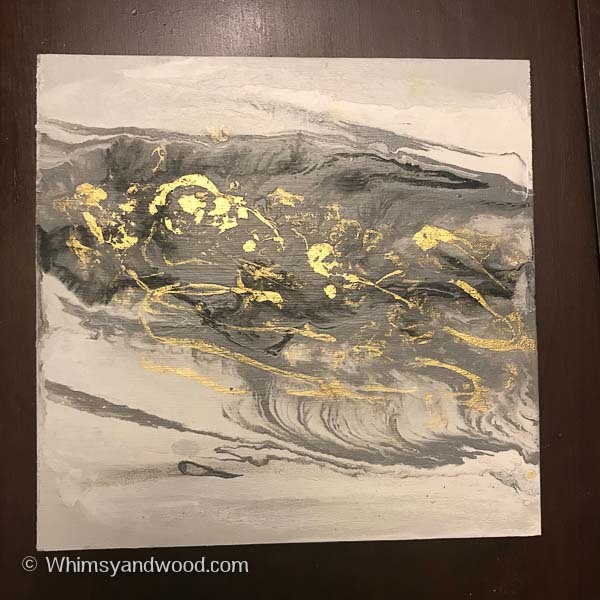 I chose to do a sample pour on a test scrap board. On this project I used only Pure Home Paints Products. I am very fortunate to work with a paint line created by an artist and formulated for furniture. Just the most amazing products! First I had painted 2 coats of Tahoe on my wood scrap. Once that dried I took my Pouring medium & squirted a few heavy lines on top of the dried paint. I used my plastic scraper spatula to spread the pouring medium. The pouring medium looks white, but dries clear. It can be mixed with paints to increase their flowy-ness. It can also be added to your "Canvas" to help the paints glide. 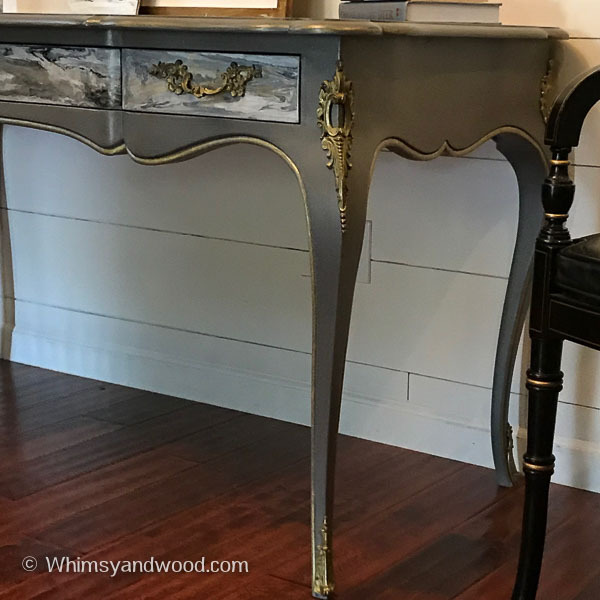 There are so many remarkable looks that can be created with an acrylic pour on furniture! I wanted to keep this one clean and classic. An abstract marble is the best I can describe. I added my White Vibrant Splatter haphazardly on the layer of pouring medium. Some lines, some puddles. I wanted a lot of white, gray as my secondary color, and black as an accent. With a good base of white I puddled gray in a few places & dripped a little black on that. Imaging a layer of white with 4 drops of gray topped with 1-2 drops of black. On a couple of my puddles I repeated the gray and black layers. My finished concept board truly felt like art! I was so excited to try my acrylic pour on furniture next! As with every piece I started with a good cleaning of my piece. a 50/50 mix of vinegar and water and followed with a clean water wipe down & a little dry time. Next I painted 2 coats of my base paint color on everything except the leather, the hardware, and the drawers. 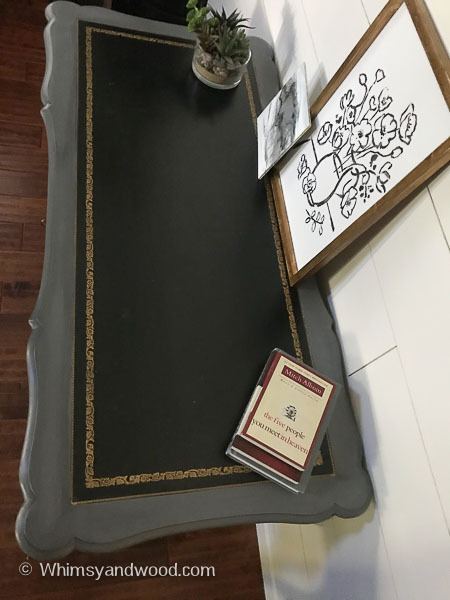 I used Stone, a neutral gray color made by Kristi Kuehl Pure Home Paints. On the drawers I wanted more white than gray so I painted the drawers in Tahoe. It is a gray, but a very white gray. Acrylic pours are messy! To protect the drawer sides and interior I wrapped them with plastic wrap and a little Frog Tape. (Pro Tip: Don't forget to tape off the handle holes on the inside of your drawer. I created a paint waterfall through mine.) My center drawer also had a keyhole, I put a small piece of painters tape on the keyhole. (just remember to remove the tape carefully before the paint dries too much, I waited about an hour and picked it out with a metal skewer. It was hard to identify where the tape was once the pour was done. I think I got lucky finding it and removing it pretty quickly. The pour done on my sample board was pretty easy since I was working on a flat piece. The drawers were a little different because of they were slim & they had a curved front. It just meant a little more tilting and working with the flow. 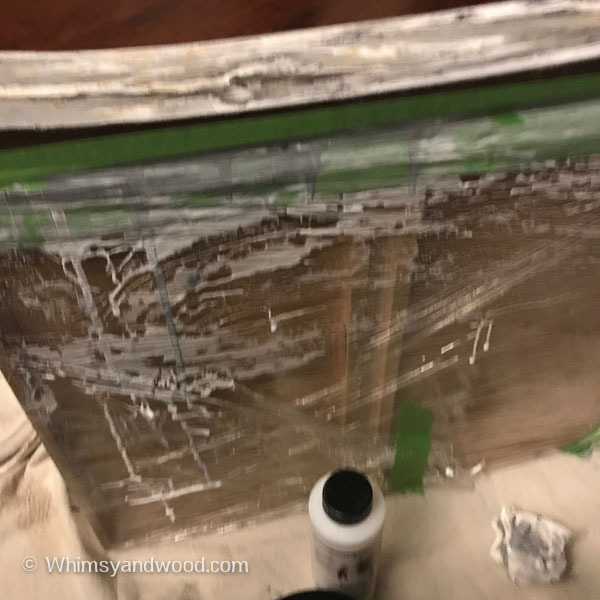 Make sure you have a heavy painting canvas or plastic in your paint area. This is a very messy drippy process. Once you have chased your paint into all the right places, set the drawer down with the drawer face up. I recommend you wipe away any paint spills and use items to make sure your drawer does not fall over before drying. You can now add your gold & set it aside to dry. Plan on letting it sit over night before handling it at all. If the paint looks loose or wet, then let it sit longer. The paint may dent with pressure for a few days after pouring, it is just still drying. 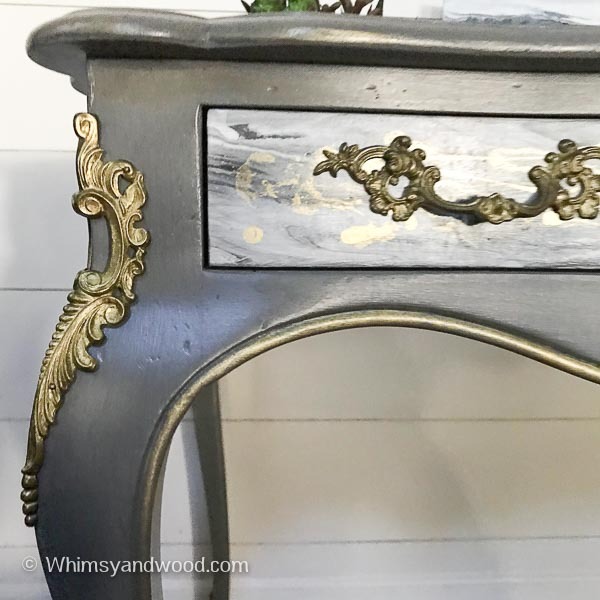 I painted that gorgeous hardware using the same metallic gold paint, but in full strength. 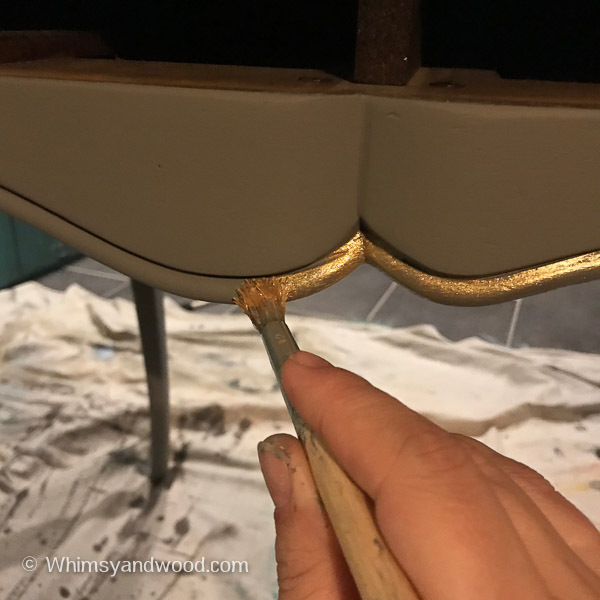 Staying with the touches of gold, I used a coarse natural bristle brush to dab the gold paint onto the edge details on all sides of the desk. I chose to dab instead of spread because I loved the texture that this technique adds. Next a coat of Matte Top Coat for protection & finally a glaze coat in Pure Home Paints Smoke. I know this sounds like so many steps, it is. Those steps, those little details make all the difference. Anyone can spread paint on furniture. But no one can do it just like you can! It is the extra attention, thought, and work that creates that piece that compels someone to take it home. 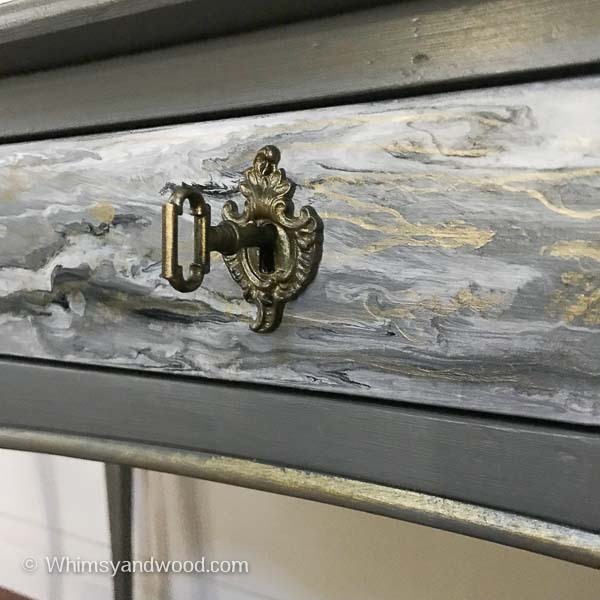 You won't want to do an acrylic pour on every piece of furniture, but every piece should get your full attention. It is the absolute best feeling when someone finds your piece on line or in your shop & feels compelled to own it. They will throw out everything else and build their space for the piece that speaks to them. that is the magic. Who will be compelled to own this piece of functional art? Will it belong to a designer? Will it work tirelessly alongside an inspired writer? Will she work double duty as a vanity? The drawers on this table are amazing!!! The whole desk is gorgeous! This is so gorgeous! You’ve inspired me. Thank you for sharing. Thank you Corinne! That is so kind of you to say! I hope to see your finished project.